Auraria Library has been reinvented. The award-winning Auraria Library building, designed by renowned architect Helmut Jahn, is an enduring icon. It is widely appreciated for its mature and sophisticated aesthetic and the seriousness of its stature. Since its inception in 1974, however, the academic library paradigm has changed dramatically. The classic modernist expression of the building has not evolved alongside the recent changes in the library world, and can feel almost mechanical at times, lacking a humanist aesthetic desired by today’s library patron. The Auraria Library yearns to be awoken, to exhale. 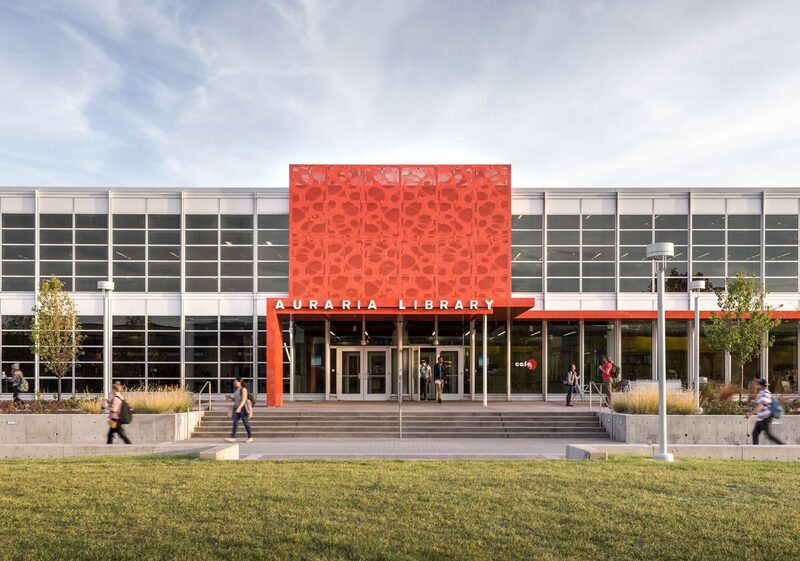 The Auraria Library aspires to be one of the top five reasons to attend one of the institutions on the Auraria Campus. To achieve this the building must first be approachable and welcoming. Next, and just as important, the building occupants must make an emotional connection with the interior environment if they are to choose to return. ALex is a typical Auraria Library explorer. ALex was conceptualized to illustrate how an iconic EXPLORER would navigate and use the library . The idea was developed based on conversations about how the library would like to communicate and interact with students in a more conversational/fun way. ALex and the icons are still in the conceptual stage of development. The next step will be to introduce the icons to users to get feedback on universality and recognition. This proces s will also open a dialogue with user s and invite them into the reinvisioning process. - their manifestation in the environ ment — applied vinyl, plaques, signage, stencils. Once we have established the parameters, we will start to develop the icons into a pattern of language that wil l be recognizable throughout the library. This pattern, once understood, will allow users to navigate the library in an exploratory way and create opportunities for discovery. Paramount to the success of this concept is universality and user recognition. As part of the development process we intend to do a “discovery launch” to introduce the icon concept to user s as a free-form public comment discussion. This process will not only open a dialogue with users and invite them into the reinvisioning process, but also ensure that the final icons reach their full potential.